Hello lovely ones and happy Winter Solstice/Cancer Full Moon/almost the end of 2018! This post is to help you work with the powerful cosmic energies, so there is some cosmic coaching, along with a customized ritual as well as channeled Soulstrology Scopes - a message for each zodiac sign (read for both your Sun and Rising sign if you know it). There is no right or wrong way, or time, to do the ritual but I highly recommend doing it on the night of the Winter Solstice, so Friday December 21 as that is just before the Full Moon. Look at the life areas ruled by Cancer in the natural zodiac, and your unique chart (Sun and Rising). What emotions do you feel around these areas of life? Which emotions are ‘strong’ as in you feel them strongly and ‘negative’ as in they make you feel sad, angry, jealous, fearful, pessimistic etc? Write a list of all the strong, negative emotions which you have identified above and you wish to release, feel free to add/include any other strong negative emotions or things you feel you wish to release at this time around other areas of life/your chart. Get outside with your list. If you can, be in nature (a hike, the beach, a lake, a river). If you can’t, just being outdoors full stop, by any form of nature will do - a garden, a tree, any vegetation, even a patio where you can look up at the open skies/stars -and just be. Sit with your list, look up at the sky, look at the moon (she is visible in the day and at night) and close your eyes. Then re-read your list and see if there is anything you want to add to it. Light a candle and burn the list. You can do this outdoors or indoors, whichever feels more comfortable to you and is easier (and safer!). As you watch the list burn, feel the energy of what you are releasing leave you as you watch the list go up in flames and the smoke rise up above. Go take a shower or bath (if you can somehow bathe in natural waters, that would be ideal, but it isn’t necessary!) If you take a shower, imagine the water is cleansing you, visualize that as it is pouring down on you it is washing away the emotions and energies you just released. If you take a bath, visualize that you are soaking away all the emotions and energies you just released. In either case watch the water go down the drain holding the visualization that it is all and any negativity, energetic, emotional or spiritual leaving your physical and energetic being. Get dried off, comfy and cosy and light some sage, incense or palo santo, put on some headphones (any will do) and listen to a Soulstrology Soundbath of your choice (there are plenty to choose from and listening to more than one is also good!). Allow yourself to free flow write after your meditation. It doesn’t need to make sense. You don’t need to get a clear message. You don’t need to work it out. Just write. If nothing comes, that’s ok, it may come later, but at least put the pen in your hand and see what may come out. It could be one word. That’s ok! 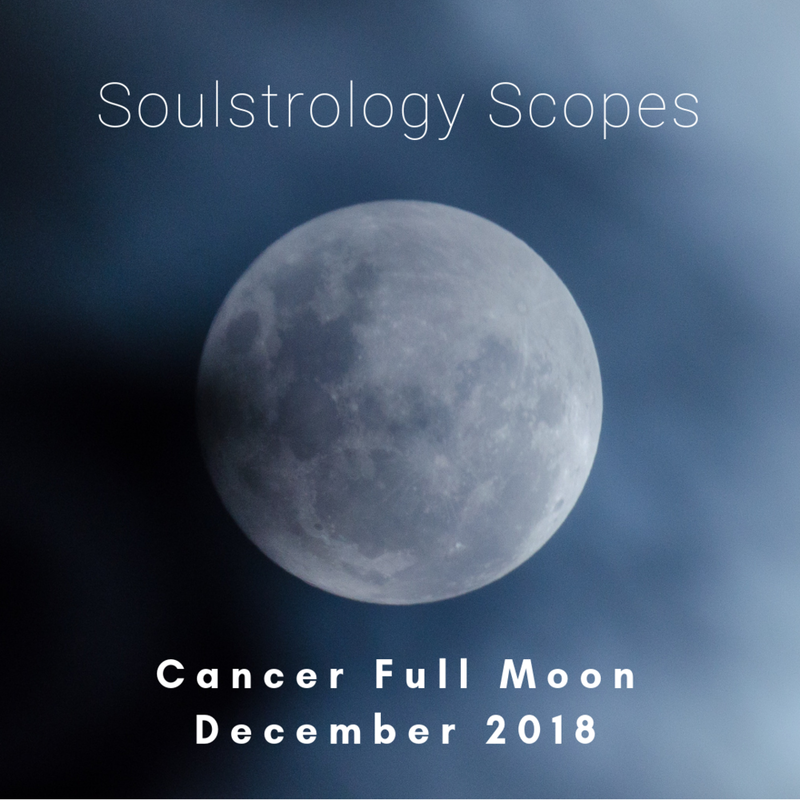 Sit with your Soulstrology Cancer Full Moon zodiac guide and look at the life areas (the same life areas you looked at to write your burn and release list) and see if any new feelings or insights come to you about these life areas. Jot them down. Celebrate! You’ve just completed a powerful ritual. It’s the last Full Moon of 2018 and it’s the start of Capricorn season and almost a New Year! Sometimes our celebrations are due to matters on the physical plane, sometimes they are down to energetic shifts which WILL result in manifesting on the physical plane. Either way, just do something to celebrate which nurtures YOU just like a good Cancer mama would. Think self-care, something indulgent, something you would do for someone you really cared about to spoil them. Treat yo’self! Finally check out your Soulstrology Scopes below. Happy almost Full Moon and Winter Solstice!